These burgers are yumtastic! 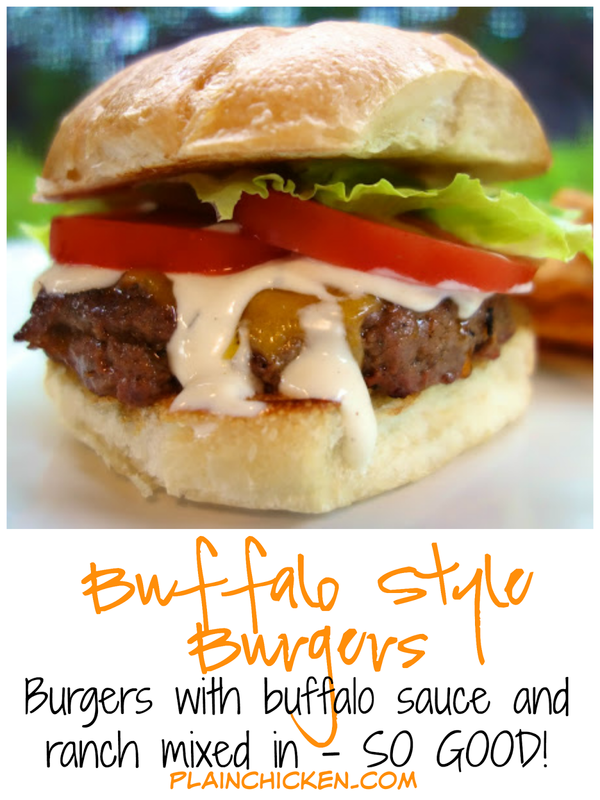 This recipe combines two of our favorite foods - burgers and buffalo wings! How can it be bad?! The burgers are packed full of wing sauce and ranch dressing mix. They are super juicy and tender. You can control the amount of heat by adjusting the amount of wing sauce in the burgers. I used 1/4 cup. I thought it was perfect, but if you are sensitive to heat you might want to drop it down to 2 Tablespoons. 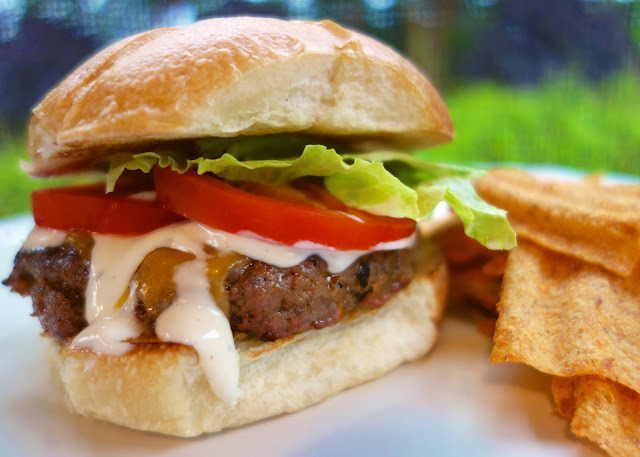 I topped the burgers with some Ranch dressing to cool them off. I loved every bite! These are definitely going into the rotation! 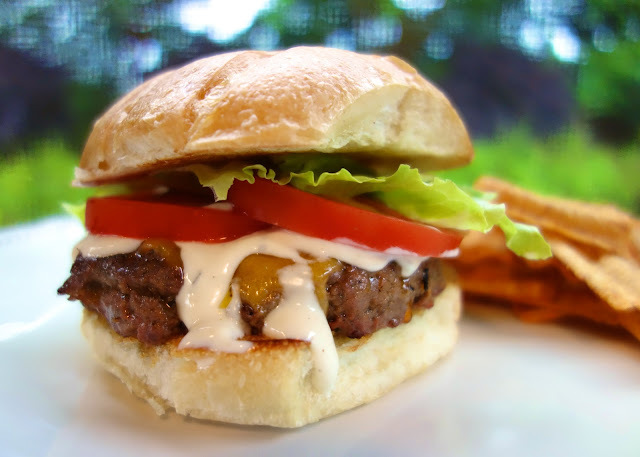 Combine hamburger, wing sauce and Ranch dressing mix. Divide meat into 3 patties. Cook to desired temperature. Top with cheese and cook until melted. 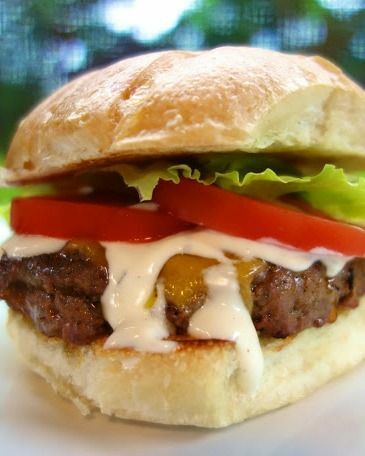 Place cooked burgers on buns and top with 1 Tbsp of Ranch dressing. I am making these for dinner tonight! Jan - I wish I were coming to dinner at your house tonight! Enjoy!! Lisa D - I almost added bleu cheese, but not everybody likes it so I went with cheddar on top. Let me know how it turns out! I made these tonight on the grill and they completely fell apart. They weren't even salvageable. I think the wing sauce just keeps them so moist. If you make these, I would highly suggest frying them in a pan not on a grill. Bummer...they sounded so good too! I made these last night for dinner and they completely fell apart on the grill. They weren't even salvageable. I think the hot sauce just keeps them really moist. I would highly recommend making these in a skillet vs on the grill. Bummer.....they sounded so good too! TrueGirl6610 - that is a bummer. We didn't have that problem with this burger. I have had burgers break apart before. I try to use beef with a higher fat content for burgers. Made these tonight, using the George Foreman, and they were awesome!!!! Thanks for the recipe! Very delicious!! love your recipes!